I've been following the development of a really cool project called Defenders of Eden. It's not just a comic book, but a full scale universe that pays loving homage to some of the great sword and sorcery properties while managing to do it's own unique thing. It's filled with beautiful art, some very cool back stories, and now it's ready to become a comic book. Through Kickstarter, the team behind Defenders of Eden has launched a great initiative to fund this very cool project. Want to learn more? So did I! I had a chance to chat with creator and writer Matthew Rodriguez and the colorist Andrew Cramer about this project. Barbecue17: Matthew, Andrew, thanks for talking with me! Before we get into talking about Defenders of Eden, can you tell us a little bit about the main men behind this project? Matthew Rodriguez: Well, First we would like to say, thanks so much for the interview. We are excited about publication. First off my name is Matthew Rodriguez and I am the writer/creator of the comic book. 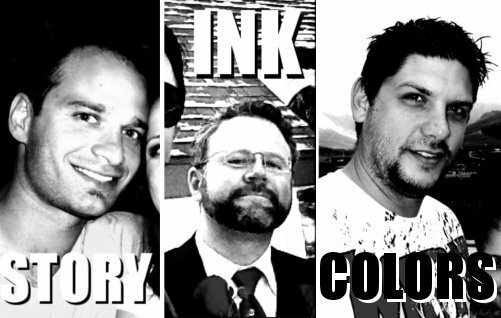 CJ Edwards out of California is our Penciler/Inker and Andrew Cramer from the great country of South Africa will be doing all of the digital coloring and a lot of layouts. As we began the process I was "in charge" of most things I would say; but honestly, the way this team has been working and blending together, input from Andrew and CJ has been incorporated not only in style and design but also in story and character conception as well. Andrew Cramer: Hi Jerry, thanks for allowing us this opportunity to talk DOE! We are very excited about this project and we have worked so hard to get to this point. I am a designer/illustrator/comic colourist from Cape Town, South Africa. I've been working on comics professionally since 2004. I worked at 99% of SA's "comic" companies (here in SA comics are mostly used for corporate communication) and in 2008 I co-founded a creative studio with some ex-work friends called "They Did This!" When Matthew and I got chatting about DOE and the chance to work on it I jumped at the opportunity. Our shared love of properties like He-Man, Thundercats, etc, and our passion for creating new worlds and characters was just a perfect match. The creative team of Defenders of Eden, L to R: Matthew Rodriguez, CJ Edwards, and Andrew Cramer. BBQ17: Tell me a little bit about Defenders of Eden. What's it all about and what does it encompass? MR: Well, it is at its core an adventure story. That is the easiest way to state it. What we are trying to establish is a world (Eden) in which a blend of machines and magic are used by both good and evil to take hold and protect the cities, kingdoms, and civilians. So pretty much anything is game, which is exciting. 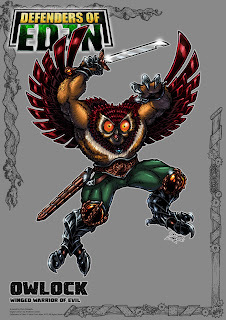 BBQ17: The first thing that strikes me about Defenders of Eden is the amazing amount of beautiful art that appears all over your site, in the comic book, and on the vast amount of posters and printed materials. Who all is responsible for this? MR: Thanks for noticing! Well honestly, we wanted to make sure that people KNEW what they were getting into. With a lot of comic properties, things can be left very open ended. A stylistic cover with a clever title sometimes can be misleading. This story is an adventure story, so we want people to think "adventure" when they see the art. CJ and Andrew have nailed this, and I have been so pleased with the level they have taken it to. It keeps me pushing to make sure my stories, and characters are just as well rounded. Now with Kickstarter, we wanted to also make sure that if people choose to partner with us and donate that they would be GREATLY rewarded with not just "soft cover, hard cover, signed hard cover" type of options, but each level gives a different piece of art, and in some, different mediums of art! BBQ17: While it's obvious that Defenders of Eden draws a lot of inspiration from Masters of the Universe, what other sources inspired you to create this world of your own? MR: I can't speak for the other guys so I will let them answer, but for me my main inspiration is toys in general. I grew up having sort of an action figure addiction, so properties like C.O.P.S., MOTU, SilverHawks. Also, X-Men has been an inspiration. I have always found the "team" concept hero style books very interesting. There are so many layers when dealing with personalities along with a conflict. 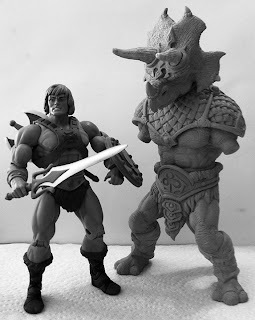 AC: Masters of the Universe has been a huge factor in my creative lifeforce! The cool minicomics and the awe-inspiring oil paintings by Rudy Obrero on the vehicle boxes just captured and fuelled my imagination from a young age. A whole host of 80s toons and such also kept the creative fires burning. Thundercats, Robotech, and Ghostbusters (Real and Filmation) amongst others all played their part. BBQ17: Tell me about the Kickstarter campaign you have going? What are we funding? MR: Well, we launched on the 3rd of June and basically what we are trying to accomplish is to publish issue 1 and launch the franchise. The funding will go directly to the building/creating/publishing of not only the book, but all of the art we have as rewards. BBQ17: What kind of benefits can backers receive? MR: I am glad you asked! I am very excited to share that we have a few well known artists that not only believe in the DoE property, but have offered their services as reward levels. I think this takes us beyond what normal comic Kickstarters have to offer, which mostly end up being variations of art, sketches, and shirts. We include things that are a bit out of the box at this stage, but considering it is an official "launch" of a property, we felt like our fans deserve it. We have a few levels of art prints that are done by featured artists, t-shirts (with 2 being limited- 5 printed ever!) and also, for the higher levels stactions and busts of the characters! 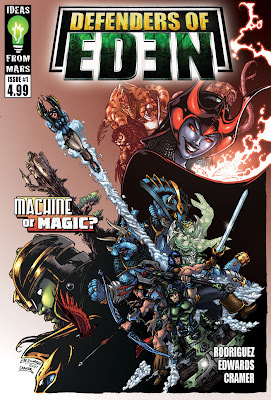 BBQ17: I'm intrigued by the line on the cover of the comic: "Machine or Magic?" What exactly does that reference? 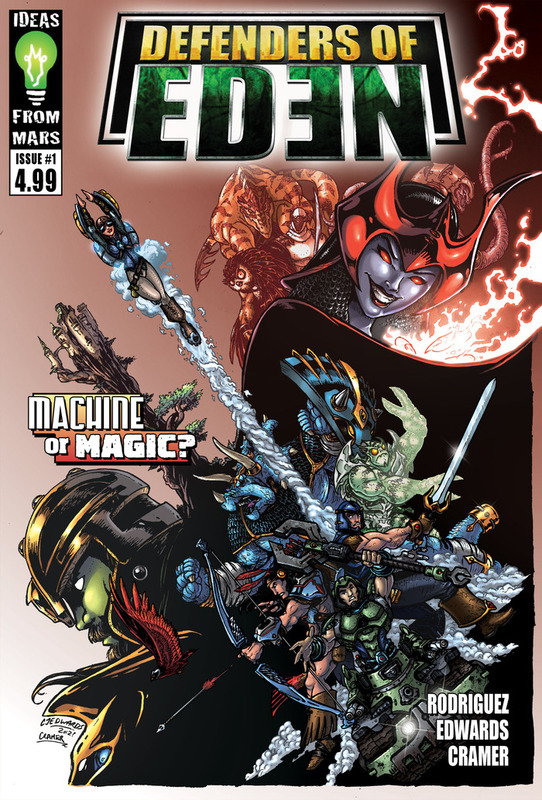 Will the struggle between magic and technology be a predominant theme in Defenders of Eden? MR: I wouldn't say that there is a struggle per say as far as both of them being separate, but we really wanted to establish the theme that both exist in different ways and both are used by good and evil. We will explore later in the series just where both magic and technology come from, so I guess I would say yes it is a theme, but the struggle between them is not. BBQ17: Tell me a little bit about the significance of choosing the name "Eden" for your fictional world? Is this just a way to justify having all of your characters run around naked at some point or is there deeper meaning to the name? MR: Well, this is one of the things that did go through some changes. 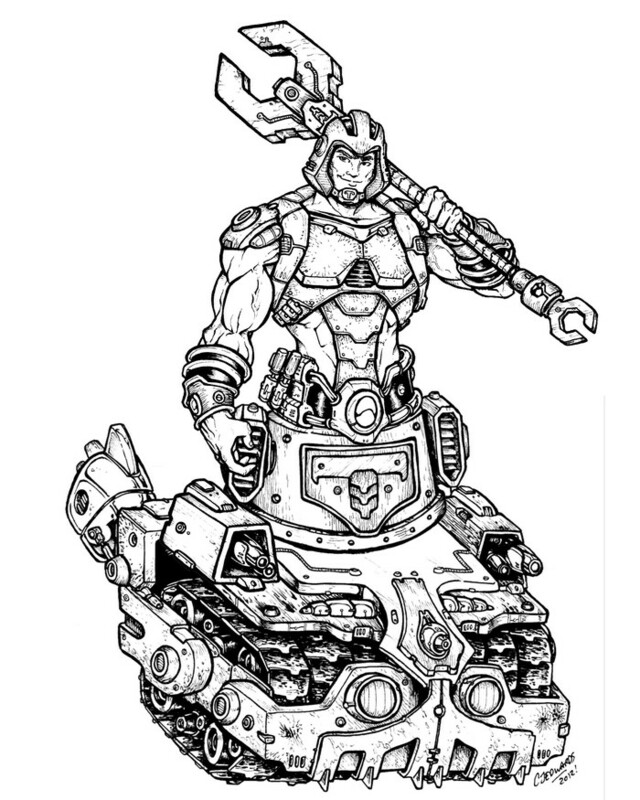 Originally the concept was called Defenders of Adonia (that was many years ago) then it changed to Neuthonia. (both are current Kingdoms) but as an over all world/planet I really wanted to incorporate a "purity" and a colorfully diverse type of culture. The term Eden, for me, always felt like a peaceful place. If someone was to be in a great place in their life they would say, "this is paradise" which I think you can use the term Eden for, and people would understand what you are saying. BBQ17: I'm a big fan of all the characters designs, especially Techtrek, Owlock, Lady Maryweather, and BaeNa. Who are your favorite characters at this point? 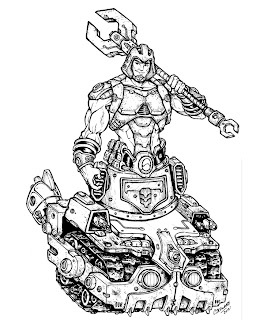 MR: For me, the unreleased Midor (a hero of old Conan style character) I think is one of my favorites. BaeNa has always been a favorite as well. Nate Baertsch, the original creator of him, is one of the pillars of inspiration for the entire line. BBQ17: You have a wealth of characters designed, lots of back-story, and an issue of the comic in the works. In regards to story and direction, what kind of series do you have planned? Is this simply a one shot? MR: As of right now it will be a continuous series. We can't really call it a "monthly" but it would fall in that category. BBQ17: What have been the challenges of getting this project started? Any significant roadblocks along the way that you've overcome? MR: The only hurdle there has ever been was the natural hurdle of location. Being from 3 different places, our team started off getting to know each other well enough that for the past 6 months, the art and communication are at a place where I think they need to be for us to continue this pursuit. From concept, to CJ, back to me with discussions and occasionally with Andrew sitting in on those brainstorms, we have found a great balance of communication, and I think that is very needed in the comic book realm. AC: For me, being a few timezones ahead of the guys really makes it more difficult to be involved in a conversation cos I'm probably in dreamland when the guys are chatting during their day. However with the miracles of email and instant messaging we have been able to keep each other in the loop. Matthew is pretty good at being online for chats whilst I'm awake. BBQ17: Matthew, you state on the Defenders of Eden blog that this project really found its roots in some drawings that you did as a kid. It seems like lots of individuals who grew up at some point in the 80's were very inspired by their toys and have set out to further create new worlds and stories because of our childhood playthings. What do you think made so many of the 80's properties inspired fans to further create their own mythologies? MR: I think that it was a creative peak for comics/toys/cartoons that I honestly don't think we will ever see again. People were willing to give chances to these creative thinkers. Much like Kickstarter does! I mean, could you imagine if some of those things were pitched today with out any "fanbase" established? They would be laughed out of the office, which honestly is sad. Its sad that the only way it seems to get a new cartoon on air is if you are remaking an old cartoon. How do you think the cartoon got that fan base in the first place?! We need more risk. Pertaining to all of the creations? About Time! I have always preached that no story will be new. EVERY THING has been done. Its the "twisting" we need to get back to. For example, I will bring up a property that most of my fans will cringe to hear: Twilight. Now, I have never read the books but respect the author for what she did. Something that was not new, twisted it just enough...... and boom. Numbers don't lie. I Don't mind all of the properties from my childhood being done into movies and new properties, but I firmly believe that the lack of "twisting" has crippled Hollywood. Avatar was a twist. We know that. We all saw Pocahontas and Fern Gully. But it was a great movie! DoE is a twist. It will feel familiar. It will make you smile, but you will love it and not think its a rip off in any way. BBQ17: Where do you want this property to be in the next 5 years? BBQ17: What item or object based on DoE, if created, would be that satisfying piece of merchandise or art that tells you: "This property made it!" Is there some piece that you just dream about seeing or holding in your hands? MR: Well, the stactions that Tom did for us really stamped it for me personally. But having the physical comic book in hand I think is something that all of us are looking forward to. AC: I think the first issue of the comic will be a major milestone for us. Having said that, the day Im holding my fully articulated 6-7" Silverglove and or "Insert a certain Wave 2 character name" action figure and DOE season 1 boxset in my hands is the day I will have a huge smile on my face. BBQ17: Final (overly complicated) Question: Skeletor, Mumm-Ra, Serpentor, Ivan Drago,and Bennet from Commando have decided to join forces and destroy Eden. They've challenged you to choose any 5 warriors you want to stand against these guys. He-Man's out sick, Lion-O's at the vet, Snake Eyes is in the shower, and Rocky and John Matrix are busy running a hamburger restaurant. Who would be on your super team to defend Eden? (You can choose any of the Defenders of Eden as well). MR: Wow. Funny thing about this question: I once had a toy battle with my older brother. I had Wolverine and my brother had all the members of Alpha Flight. My reasoning was that in all comic/cartoon references I had of Wolverine, Wolverine should win. My brother claims that with his strategy, he would easily beat Wolverine. I really don't know how it turned out. That being said, Howard the Duck, Nic Cage, Ralph the Dog (The Muppets) and Maverick. 90's Weapon X Maverick, none of this Phantom X agent Z bull crap. Runners up would be LongArm from COPS, TechTrek, Aladdin and Ironman (my wife would kill me if I didn't say him. But honestly, I could answer Robert Downey Jr and she would be just as satisfied. BBQ17: Any Final words for our readers? MR: We are firm believers in Kickstarter and outlets like it. I think that its amazing that little guys like us can realize our dreams with the help of family, friends, and supporters. It's been great getting to know people along the way that love the project. Once again, big thanks to Matthew for answering my long list of questions. Here's your chance to get in on the next big thing, folks! Check out Defenders of Eden on Kickstarter and chip in. The art truly is gorgeous and the character design is really appealing, especially to fans of 1980s toy properties. These guys are are obviously very passionate about this project and I personally wish them the best. I just chipped in to get my copy of issue #1 and I hope you do too! You can follow more Defenders of Eden updates on their website or on their Facebook page.  Also, make sure to like The Epic Review on Facebook and follow us on Twitter @thepicreview more updates about all the things you care about!